After a few years of living near the San Gabriel mountains, Callie and I are beginning to run out of new trails to explore in the local area. Most of the obvious choices have been tackled at least once, so now we are left with checking out some of the more obscure nearby trails, venturing further out to other wilderness areas, or repeating some of our favorite local hikes. Each option has its own appeal. This time, exploring a new area of our local mountains was the trip of choice, and the Three Points trailhead was the intended destination. The Three Points trail always looked appealing to me on a map, and when I briefly walked down to the southern face of Mount Waterman during a recent hike, I scouted part of the trail and liked what I saw. The trail’s lack of popularity made it difficult to gather much intel on it though. I was especially curious about the trail’s current conditions given that part of the area was impacted by the Station Fire, and I was disappointed by the lack of what I found in my online searches. All the more reason the check it out so I can share it with all of you. The trailhead is very difficult to find. It is located at a place where the PCT crosses the Angeles Crest Highway, but there aren’t any signs or obvious indicators that point the location out. In fact, I had the spot on my GPS and still drove right by it initially because I assumed it would stick out more. So, if you attempt this trail, I recommend that you also have a GPS to help figure out where to park and start your hike. The hike starts on the PCT for a very short stretch before the Three Points trail diverts off the southern side of the trail. At the trail junction, a large fallen tree covers the first part of the Three Points trail, which sadly turned out to be an accurate foreshadowing of the next couple of miles. Walking along surrounded by miles of scorched earth, with large charred trees still flanking the trail, the devastation of the Station Fire feels palpable up here. Meanwhile, the freshly fallen trees that frequently block the trail are a reminder that the effects of the fire will continue to impact this landscape for years to come. In most cases, we were able to go around them without much additional effort, but occasionally the landscape was less forgiving and we were forced to scramble over, or under the trees. I had expected the first part of the trail to still be suffering from fire damage, but I underestimated the extent of the fire’s path. Almost the entire trail up until you reach the south face of Waterman suffers from varying degrees of fire damage, but it fortunately begins to become less severe. Since we were hiking on a hot afternoon, we sorely missed the shade the trees would have provided. This stretch is more less completely exposed to the sun. The trail does have a few saving graces at least. For one, there are some very cool rock formations along the trail, which are a rare but welcomed sight in the San Gabriels. There are some pretty epic views to the south as well. This trail provides a window into some of the most remote parts of the Angeles National Forest. At last, the trail clears the border of the Station Fire and returns to its natural environment. The contrast is startling, and the trail feels like a perfect PSA to encourage people to not start forest fires. I truly hope that we can protect remaining forests like this from future devastation. Otherwise, all of Socal’s mountains could someday resemble the Three Points trail. 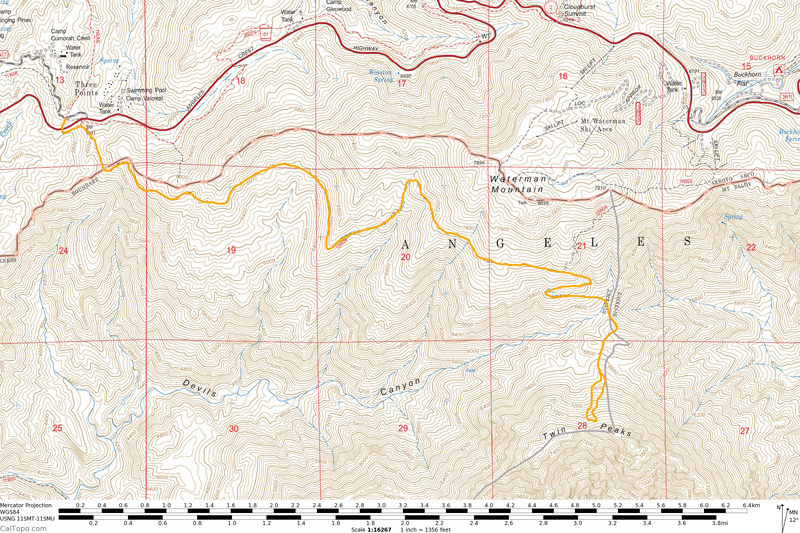 Shortly after reaching the border of the Station Fire, the trail intersects with the Mount Waterman trail. By now, the Twin Peaks are within clear sight, and we were caught off guard to see them blanketed in snow. Granted, at this time of year, it should be a given that the Twin Peaks are inaccessible without winter gear, but this winter has been extremely dry, and I had naively assumed that the snow from the heavy storm two weeks ago had all melted off in the warm spring heat. From the junction, the trail continues to dip down a few hundred feet more to the saddle between Twin Peaks and Waterman. The saddle is about a thousand feet below the high point on the trail leading up to it, so there ends up being quite a bit of redundant elevation gain on the hike. On this stretch, we ran into the only water source for the hike. The small trickle provided the perfect rest break for Callie but didn’t look like an appetizing source for humans. At the saddle, Callie and I ran into another hiker and his dog. Russell, the 7 month old lab, was a worthy match for Callie’s energy on the trail and in the snow, and with that common ground established, they were friendly with each other immediately. We decided to join up and see if we could tackle the snowy slope leading to the Twin Peaks despite not having brought any traction for our boots. I silently lamented about leaving all of my snow gear at home. I could have easily just made Callie carry it! As we made our way up, the “trail” became steeper and the snow coverage more consistent. Things got sketchy fairly quickly. The snow was still quite solid on the surface despite very warm afternoon temps, and without any traction we had barely any footing. We began to navigate around the snowy stretches by utilizing small sections of dirt and rock to create islands of traction up the slope. This continued for longer than it should have. There were a few moments where I felt a sense that I should turn around, but having gone so far into the hike and being only a few hundred feet from the summit, the urge to press on continued to win out. There’s something foreign about hiking miles towards a peak, and turning around right before you get to it. It goes against muscle memory. Plus, one of the nicest things about hiking is being able to remove yourself from the normal day to day decision making that dominates modern life. Out on the trail, there is usually little more to think about than just putting one foot in front of the other, and that simplicity is incredibly freeing. So, when an important decision suddenly presents itself, it’s all too easy to dismiss it and just continue on up the trail in an unconcerned bliss. The problem is that every time you put off that important decision, your inaction becomes a decision in itself, and on the wrong day, it can be the worst decision you make in your entire life. Eventually, I remembered this important wisdom. Looking up at a few hundred feet of elevation ahead of me, the futility and irresponsibility of heading up the hill became immediately clear. So, this ended up being our view from the high point of the day, a short but sketchy distance from the summit. The hike back down the steep snowy slope confirmed that we made the right call to turn around. I took a slip and glissaded down about 20 feet at one point, which is not something I advise on a rocky slope 5 miles from your car. Thankfully, we all made it down in one piece, wiser from the experience. The two groups parted ways, and Callie and I took a long break in the woods and savored the pristine forest before venturing out to the exposed burned section of the trail. The rest of the hike was retreading the familiar, somewhat depressing Three Points trail, thinking about what it once was like and what the future holds for my local wilderness. Very cool!! Yeah, you were smart to turn around. But what a nice hike. I have a question for you. What backpacking destination could you recommend for the Sierras before the high sierra snow melt? Like end of April to end of May (ie. Memorial day weekend). Something like a 10 to 16 mile out and back where we could just base camp in one spot for 2 or 3 nights (with two dogs). Some place with a nice lake or stream. We like having time to just relax so we enjoy doing 3 nights where only 1 is necessary. J If there isn’t anything viable in the Sierras, maybe local mountains. We are from South OC. I love your blog!!! Thank you. That’s a tough one Jeff. There are a lot of factors this year that are so out of the ordinary. I don’t think many of our local mountains will have much to speak of regarding lakes or streams. The Sierra will still be pretty inaccessible around then. I think your best bets would be doing a hike around Cottonwood Lakes or Kennedy Meadows. Keep a close eye on the weather report before you head out and bring a very warm sleeping bag. Thank you for the tip! Maybe we will wait for the first week of July for the high Sierras then. Probably not worth risking. We aren’t survival experts or anything. 🙂 I will look into Cottonwood Lakes or Kennedy Meadows. Thanks again! Ive read every one of your entries and am blown away by all the pictures. Truly outstanding. Twin Peaks is steep enough and tough enough without the snow! Good choice turning back. The first time I hiked this I didn’t realize there was a parking lot for three points off Sulfur Springs road. I made a similar mistake last Sunday thinking I could go further up Angeles Crest while not realizing there was still snow. Ended up hiking the PCT from Cloudburst Summit. The snow on Twin Peaks lasts longer then many north slopes due to how steep it is. I had a similar experience in May of 2008 or so where I hit snow and refused to turn around. I hit an icy patch halfway up and lost all traction sliding about 10 feet before I could arrest myself. I turned myself around and called it a day.